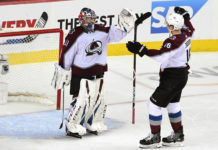 After dominating the majority of the play in regulation, the Avalanche nearly lost the game late in the third period when Sean Monahan got loose in front to beat Philipp Grubauer after a few blocked shots. All of the hard work from the Avs looked like it would be for naught, but a hero would emerge late, as J.T. Compher would clean up the garbage in front of the net with Grubauer pulled to tie the game with just under three minutes remaining. 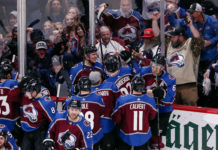 With the game tied, the game would head to overtime, something the Avs did not have to do last season against Nashville. In overtime, the Avs would kill off an Ian Cole penalty to keep the game going. Just a little over eight minutes into overtime, Grubauer would make a huge stop on a wide open Michael Frolik, and the Avs would transition the other way. Mikko Rantanen hit a flying Nathan MacKinnon to enter the zone, and MacKinnon would waste no time labeling a shot high glove past Mike Smith to win the game for the Avs. The shot would be MacKinnon’s 12th attempted shot of the night. The series now transitions back to Colorado tied at 1. With the win, the Avs have now taken over home ice advantage. Game three will take place on Monday night at the Pepsi Center. The game starts at 8 PM MST. Make no mistake, the Avalanche deserved to win this game. 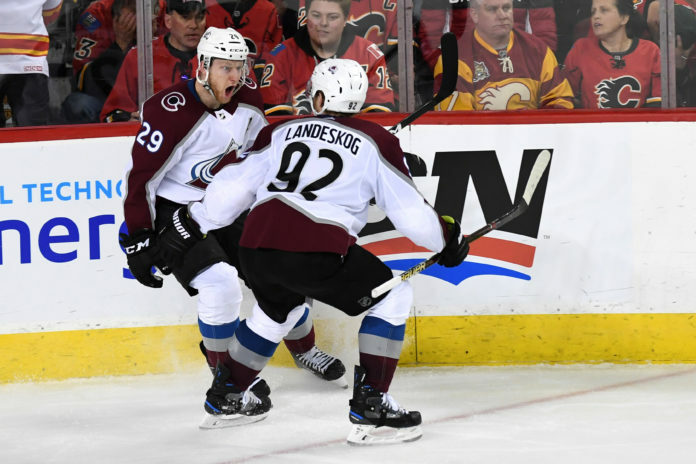 Through regulation, the Avs out attempted the Flames at even strength a ridiculous 56-26, meaning they controlled 68% of the shot attempts in the game. They were the better team from start to finish. Matthew Tkachuk was Mr. Everything in game one for the Flames, but he was invisible tonight. On the first shift of the game, Nikita Zadorov caught him with his head down along the boards and Tkachuk looked shaken up. He didn’t have nearly the same impact on this game, and that’s what Zadorov can provide that no other player on the Avs can. J.T. 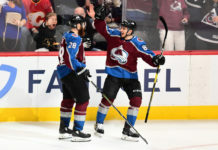 Compher also helped set a physical tone very early in this game, throwing a massive hit on Mark Giordano on the penalty kill. Through 60 minutes of play, Gabriel Landeskog was having one of the more dominant games you will find from anyone in terms of possession. He was on the ice for 30 shot attempts towards the Flames net, and only 4 agains the Avs. That means the Avs controlled 88% of the attempts when he was on the ice. He did everything for the team tonight, and continues to be their heart and soul. Philipp Grubauer continues to be calm, cool and collected in net for the Avs, and it looks like that is helping a team that is still very young. Grubauer stopped 35 of the 37 shots he faced, and had to make two massive saves at the end of regulation to even get it to overtime. His save on Frolik right before the game winner by MacKinnon is the type of thing that can turn a series around. Amongst all the great things the Avs did tonight, they may have lost Sam Girard to injury in the second consecutive postseason. Sam Bennett took a run up high on Girard in overtime and he would not return to the game. Girard is essential to the Avs puck movement on defense, and losing him would be tough to overcome. The only silver lining to all of it is that the Avs may be adding stud prospect Cale Makar as early as Sunday. Makar has no NHL experience, but someone with his talent can make a massive difference in a short series.